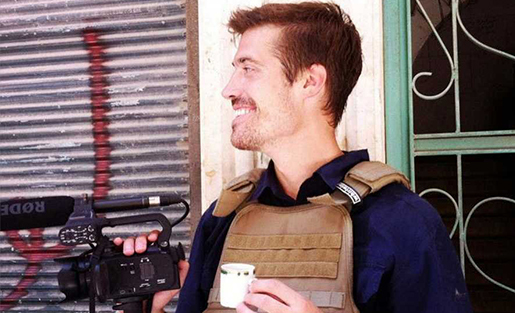 Freelance video journalist James Foley in Syria before he was captured in November, 2012. Photo courtesy of www.freejamesfoley.org. August 2014 was a horrific month for freelance journalists. We are still mourning the loss of our colleagues, James (Jim) Foley and Steven Sotloff, Americans who entered Syria to report on the country’s violent civil war. Both were talented journalists who focused their reporting on the human rights abuses of Syrian civilians. But in their last moments, Jim and Steven, wearing bright orange suits under hazy desert skies, suddenly had professional cameras and microphones aimed squarely at them. Tragically, as unwilling participants in a sinister Islamic State propaganda film, they were murdered in the most barbaric way. Through their very public and widely reported deaths, Jim and Steven were able to shed light on one last human rights issue: the fact that the riskiest jobs in journalism, in war zones and repressive regimes, are still being done by uninsured freelancers. After the Islamic State videos surfaced, pundits finally began commenting on the risks uninsured freelancers take to bring us the news. Several news companies and wire services finally began re-evaluating their policies toward freelancers. Jim and Steven most certainly did not die in vain. 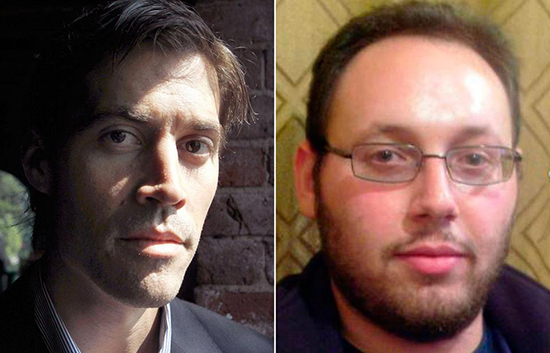 Jim Foley and Steven Sotloff. As a freelance war correspondent myself for many years, I’m certain one thing will never change: There will always be freelancers who enter conflict zones to report. There will always be publishers who want to commission their stories. We founded Storyhunter because we realized the way media companies and freelancers worked together was inefficient and in many cases, unethical. With our platform growing to thousands of professional journalists, photographers, and filmmakers working in over 130 countries, including Iraq and Syria, we made it our mission to figure out how to protect not just our community members, but all freelance journalists. Over the past eight months, we reached out to scores of insurance companies around the world, receiving a dozen different proposals. We learned about the specific insurance needs of our publishing partners and consulted with our freelance war correspondents about what a perfect insurance plan would look like. Today, we are proud to announce that, from this point forward, every freelancer commissioned to work in a conflict zone through our platform will automatically receive a top-of-the-line insurance plan, free of charge. We looked at many different policies, but one offer by April International, a Canadian insurance company, seemed to be most suitable for war correspondents. This plan, used by Reporters Without Borders, offers up to $1 million to cover medical expenses, even when the injury occurred after an act of war and terrorism. In kidnapping cases, the policy covers the medical rehabilitation needed after journalists are released. In the worst-case scenario, it covers the repatriation of the body. The one thing the policy doesn’t cover is ransoms. Such policies do exist, but as a U.S.-based company, we would not be legally permitted to pay out a ransom to any organization the U.S. government deems a terrorist group. Thus, we did not include it as part of our blanket coverage. When I last wrote about this topic, I told the story of freelance photojournalist Ricardo Garcia Vilanova, a member of our Storyhunter community who was kidnapped and likely held by the same group that beheaded Jim and Steven. While his family and the Spanish government were desperately trying to secure his release through back channels, my team was told the best thing we could do was just be quiet. This was a difficult and frustrating time for us. With more human lives at stake, we realized that the issue of insurance had to be prioritized over everything else. That’s when we begin looking for the right policy for our community. 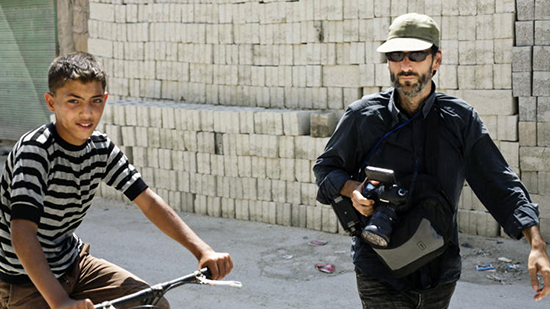 Freelance photojournalist Ricardo Garcia Vilanova, right, reporting in Aleppo, Syria. He was released after more than 6 months in captivity. We believe it is a moral imperative that we make insurance available to all freelance journalists. However, we’re aware that it won’t prevent kidnappings or attacks on the press. There is much more that all media companies can do to keep freelancers safe. For example, we regularly dissuade freelancers from entering the most dangerous places, such as Syria, Iran and North Korea. We won’t accept pitches or commission stories from foreign journalists in these countries. For conflict zones with manageable risks, like parts of Iraq, Gaza, and Honduras, we make sure to connect any freelancer going into the zone with other local journalists and fixers in our network who are more familiar with the territory. We also verify that the journalist has both hostile environment training and first aid training from RISC or equivalent organizations. We believe that no story is worth a journalist’s life or limb. Insurance is a small price to pay for the work freelancers do, and benefits everyone involved. Freelancers and their families get peace of mind and a financial safety net if things go wrong. Media companies get to source their content responsibly, and know that they won’t be on the hook if something goes awry. Viewers and readers get to consume a sustainable, ethically produced media product. We know we’ve got a long way to go to, but in honor of Jim and Steven and all the freelancers who are still missing in Syria right now, we are doing the best we can. It is time to protect the selfless souls of the world who shed light on the human rights abuses of others before their own. Jaron Gilinsky is a freelance video journalist and founder of Storyhunter.